"YOU SANK MY BATTLESHIP!" Now that's a cry that reminds me of summer. 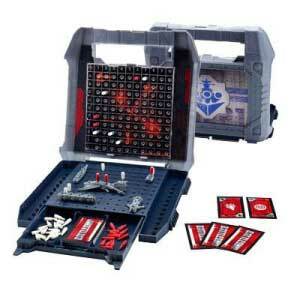 When I was a kid, the classic game, Battleship, was one of my favorites. It was so easy to learn and yet with that plastic partition separating me from my friend, I often did feel a little like a Navy captain going to war. 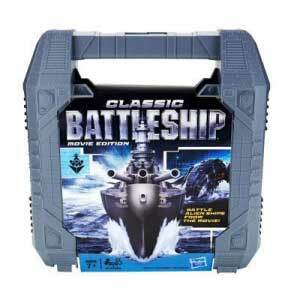 Battleshipis a timeless game for both young and old alike, but now with the premier of the Battleship motion picture from Universal Studios, Hasbro has decided to update this classic to fit the premise of the movie better. Keep reading to learn more! Based on the 2012 debut Battleship motion picture, this movie-themed version of the classic Battleship game brings to life all the excitement of the big screen. Sink your opponent's feel before he sinks yours in this heart-pounding, action-packed naval combat game. Choose to command the Navy or the alien fleet, and defeat your enemy with new special ops cards that allow you to fire out complete columns of coordinates. Fire as many shots as you have ships, or force your opponent to reveal un-hit coordinates. The classic "hit" or "miss" game comes in two folding hard cases that make it convenient to transport and store all of the pieces for easy play. This is the perfect summer travel game, great to take with you on a short trip to grandma's house or on a cross-country vacation. I hadn't played Battleshipin ages, but took to it again like a fish to water when playing a round of it with my husband. We both had a great time and I can already foresee many more Navy vs. Aliens battles in our household! If your child is a fan of the Battleship movie, then I'm sure they will enjoy the KRE-O Battleship Combat Chopper Construction Set too. With this set, kids can pretend to take their missions to the skies. 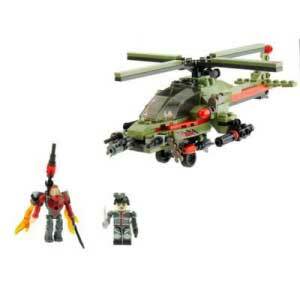 Construct the helicopter vehicle, place the KREON fighter pilot inside the cockpit, push the lever to spin the rotor and launch missiles at incoming alien attacks. This building set includes 174 bricks, one KREON fighter pilot and one alien KREON figure with a twin turbine jetpack. 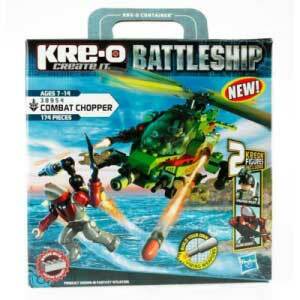 The KRE-O Battleship Combat Chopper Construction Setis designed for children ages 7 years old and up and its bricks even work well with other leading brands' building blocks. Thanks to Hasbro, your child can fly an aerial battle vehicle equipped with enough firepower to blast any enemy out of the sky. With two firing missiles, and rotor blades that really spin, this awesome aircraft is capable of out-fighting anything in the air – especially with you and the elite KREON Fighter Pilot at the helm! Disclosure: I received the Classic Battleship and KRE-O Combat Chopper Construction Set from Hasbro Games in order to facilitate my review. No other compensation was received. This product review is based on my own personal experiences with this item and is completely honest and objective. I’d like to add Hasbro’s Connect 4 to our family game night because I loved playing that game a child! My family would love Twister! I’d like to get Pictureka! I’d love the Dora The Explorer game for our family. Thanks.